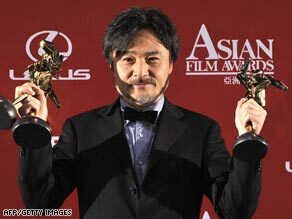 Japan's Hirokazu Koreeda wins Best Director for "Still Walking"
LONDON, England (CNN) -- Japanese films dominated the 2009 Asian Film Awards, as Kiyoshi Kurosawa won Best Film and Best Screenwriter for "Tokyo Sonata." Japanese director Kiyoshi Kurosawa, who won Best Film and Best Screenwriter for "Tokyo Sonata" at the Asia Film Awards. After winning the Oscar for Best Foreign Film earlier this year, the Japanese hit "Departures" clinched a Best Actor award for Masahiro Motoki for his role as cellist turned mortuary embalmer. Meanwhile Japan's Hirokazu Koreeda won Best Director for "Still Walking." "Tokyo Sonata," the emotional story of a contemporary Japanese family beat out the night's top contender, "The Good, the Bad, the Weird," a quirky South Korean Western. The award for Best Actress went to China's Zhou Xun for her performance in the psychological thriller "The Equation of Love and Death." Do you agree with the judges choices? Which films do you think should have won that didn't? Tell us below in the SoundOff box. A special award, the Nielsen Box Office award for outstanding contribution to film was also given to Indian actress, Priyanka Chopra by The Hollywood Reporter. In total, 36 films from across Asia competed in 13 categories. Awards were given by a jury of international film critics and professionals, presided over by Malaysian-born actress, and former Bond girl, Michelle Yeoh. The third annual awards show ceremony was held in conjunction with the 33rd Hong Kong International Film Festival. The event draws film stars and entertainment heavyweights from around the world, including American director Oliver Stone, who presented the award for Best Director.